Based on two lectures given by Frank Kermode as the Tanner Lectures at Berkeley in 2001, the main text runs to fewer than fifty pages, and is flanked by a ten-page introduction and four short responses to his essays by invited learned cultural commentators. The book also includes a final and concise reply by Kermode to these learned comments, as well as an index which accounts for eight pages (the lectures and the responses are after all dripping in literary references and allusions). All this together makes this work of not even a hundred pages a most challenging enterprise and a brilliant discussion of what has come to be know in the serious business of literature as the ‘canon’, or more properly speaking ‘canons’. But despite, or even because of, its relatively short length, Pleasure and Change, the Aesthetics of Canon is a most welcome contribution to the metacritical literature of ‘cultural debate’ as it relates to ‘modern critical thinking’ as applied to literature. In the course of a long career, Kermode has seen many critical methodologies come into fashion and go out again – and admits that it has been his ‘inescapable fate to live and work’ under the older lit crit dispensations and the metacritical new – though in his two lectures he does not set out to discuss the ‘canon’ and what it consists of or should consist of, rather with total ease, great care and much less prescriptive an attitude, he enters into a discussion of canons and how at different times those discussions have been informed, organised and made flesh. What Kermode is writing about is ‘canonicity’ rather than canon. This distinguishes Kermode radically from Harold Bloom, who would be the ‘onlie begetter’ and who set in print a long, but not uninteresting or uncontentious, list of approved writings that constitute the canon for him. Kermode is much too shrewd to go down that route; besides the Trustees of the Tanner Lectures would not have invited Kermode to deliver these lectures had he not promised more than a list of his Top 100 Books. Kermode begins by recalling that, ‘there was a time when discussion of canons was angry but simple in the manner of Dr Leavis: should Milton be dislodged, or Shelley saved from demotion to the apocrypha?’, but he soon reminds us that, ‘it was rarely ever suggested that the entire canon, whatever its members, should be decanonized’ and that beneath the arguments, ‘was a general agreement that getting the canon right was a social issue’. Such discussions centred upon the now quaint notions of ‘literary quality’. And then it all changed and ‘criticism, as formally understood, suffered in company with its subject, and experts moved easily up to what, if you approved, you might call a metacritical level’. After the shortest of trips down memory lane and a few passing nods to Matthew Arnold, IA Richards, Leavis, Empson, Frye, Blackmur and Derrida too, Kermode moves to his quarry, to the central argument of his first lecture, which is ‘pleasure’, and introduces this aesthetic response into his discussion of canon. ‘Pleasure,’ he points out, ‘has a rather restricted part in modern critical thinking’. Kermode allows that ‘pleasure’ and the ‘canon’ may at first seem uneasy bedfellows, but in his ‘prooftext’ – Wordsworth’s ‘Resolution and Independence’, an ‘archetypal Romantic poem’, with its ‘peculiar grace’ – he strides into the contemporary academic arena to synthesise brilliantly in his argument certain elements of Barthesian critical thought with his own. Following his short disquisition on Barthes and his writings on the subtle distinctions, in the world of text and criticism, between plaisir and jouissance, where in the latter any element of pleasure is mixed with dismay, Kermode advances his argument about ‘pleasure’ with reference to this Wordsworth poem, in which he finds a curious blend of delight and dismay, or the juxtaposition or collision of pleasure and dismay. Kermode writes persuasively, incisively, passionately. There are no Wordsworthian ‘untoward thoughts’ in Kermode’s argument, and nowhere does he grant himself the privileges of old age or its safe vantage point to review his life in criticism or to expound predictable views on the subject, as one might perhaps expect a grand old man of letters to do. Kermode writes and argues now as vitally as ever he did. In his second lecture, Kermode introduces two further key terms, ‘change’ and ‘chance’. Like ‘the great statute of the general Du Puy’ in Wallace Stevens’ poem, he argues ‘texts must change, or rather we must choose to grant them the blessing of change, for that will save them from their only other possible fate, namely, to be rubbish in the end’. Along with ‘pleasure’, Kermode puts forward persuasive argument that ‘change’ and ‘chance’ are also elements that help form canon. Again, after a brief discussion of ‘reception history’ in which Kermode reminds us that Dante, Botticelli, even Bach and Monteverdi, ‘endured long periods of oblivion until the conversation changed and they were revived’ and argues that irrespective of whether ‘the canon is formed by theological fiat or pedagogical authority or indeed chance, each member of it fully exists only in the company of others,’ and that, ‘in a sense all become part of one larger book and all are changed in the process’. He adds, ‘a book inside a canon is a different book from what it would have been outside that canon’. What is central to this neat argument is that, ‘all this reinforces the proposition that there is an element of chance in canonicity, and many examples testify to the truth of this’. Kermode argues that, ‘we ourselves make canons by attending closely to texts and contexts, but there may be among those texts some we choose not to attend to and which remain there by inertia.’ Chance also includes discovery and rediscovery, once works are retrieved they can be ‘kept alive by conversation,’ eventually supported by ‘serious scholarship,’ and just as these additions can allow the canon to expand, where there is a withdrawal of attention, when works stop being talked about, the canon can also contract. Where ‘change’ is concerned, Kermode writes that ‘changes in the canon obviously reflect changes in ourselves and our culture. It is a register of how our historical self-understandings are formed and modified’. And for Kermode the source of change of most interest to himself is ‘the more personal element in our responses, to individual poems or parts of poems, which one may possess or be possessed by, providers of pleasure and dismay’. In this part of his lecture, Kermode looks to Arnold’s famous ‘touchstones,’ which he had devised ‘with some notion of making out of such private experience a set of civilised literary norms acceptable to an educated public,’ and demonstrates that ‘touchstone passages cannot, for all time and for everybody, bear the broad cultural significance Arnold claimed for them’. Kermode has circled around his themes: pleasure and change and canon. By no means does he himself attempt to attack, damage or destroy canon, but he has demonstrated that within the canon there is both continuity and change and that canons are ‘replaced, condemned, or subjected to new commentary’. Kermode concludes with the idea that ‘individuals, sharing with others certain powers, change the canon to match their modernity. So a canon changes, and the changes renew the supply of both pleasure and its potent derivative, dismay’. 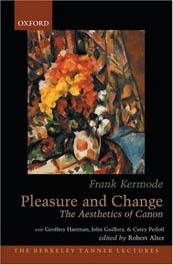 Pleasure and Change, the Aesthetics of Canon by Frank Kermode, edited by Robert Alter. The Berkeley Tanner Lectures, Oxford University Press (ISBN 0195171373 £10.50 HBK).